Home » FUJIYA Co. Ltd.
LINE Bubble 2 teams up with Peko for this deliciously sweet collaboration! 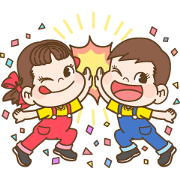 Clear special in-game conditions within LINE Bubble 2 to get these cute stickers. Don’t miss your chance!